Sign up for a membership at one of the gyms or fitness clubs in Tokyo and make a commitment to staying in shape. Many are in locations which can be easily accessed on your way to or from work. Located just 3 minutes walk from Roppongi Hills, Club 360 specializes in personal training, physiotherapy (rehabilitation), group classes, boxing and sports massage. Featuring a large fitness studio, private treatment rooms, and a fully equipped resistance-training zone, Club 360 has all you need to achieve your health and lifestyle goals. For your convenience, Club 360 also has pristine showering facilities and an organic protein bar. Directly connected from Roppongi-Itchome Sta. Note Membership conditions: over 30 years old and subject to a screening process. Areas Aoyama, Meguro, Jiyugaoka, Yokohama, etc. Areas Harajuku, Omotesando, Yokohama, etc. 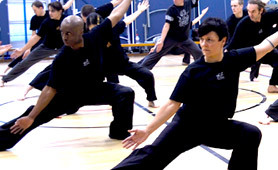 Mei Quan Academy teaches Tai Chi and Qi gong; ancient arts that encompass relaxation, martial art, meditation and Asian philosophy. Regular practice improves overall health, strength and suppleness, increases energy and develops calmness and focus of the mind. Weekly classes take place in Roppongi (evening) and Hiroo (daytime) in a friendly, dedicated and welcoming atmosphere. All classes are taught in English. Beginners’ courses start regularly throughout the year. Advance booking is recommended. Areas Shibuya, Roppongi, Shinjuku, Yokohama, etc.